probably psychosomatic and disabled him from his job as a headmaster, we can assume that his altered mental state enabled him to touch the very limits of his compositional art. It remains a paradox that this monumental sacred work has not been performed more often. It was never published until 2015, and a year later, the very first recording available to the public was made. a professional musician and successful composer – but his fate, or, if you prefer, God led him in a somewhat different direction. And so this versatile artist inspired by the Muses, a composer, poet and philosopher, ended up in the rural town of Rožmitál pod Tøemšínem, where he dutifully performed his job as a teacher. However, the sound of music in his heart did not fade away – quite the contrary. He put his talent mainly in the service of church music, writing compositions for the choir of Rožmitál which abound in fresh inventiveness and ability, through musical language, to convey Christian messages and mysteries to the common people. The name of the most prominent Czech teacher-musician at the turn of the eighteenth and nineteenth centuries, the well-educated teacher and choirmaster in Rožmitál, composer, writer and poet Jakub (Šimon) Jan Ryba (26 October 1765 – 8 April 1815) is still mostly remembered in connection with his Èeská mše vánoèní (Czech Christmas Mass) from 1796. As the only original Czech mass ever, it ensured recognition for its composer not only across Europe but also overseas. On the other hand, the rest of his extensive and diverse work still goes unnoticed and is only available to a narrow circle of music experts and several enthusiastic admirers. in 1788 until his death. Besides these compositions he also wrote numerous works the scope, instrumentation and complexity of which exceeded local capacities. The majority of them were compositions dedicated to the choir in Plzeò. a slight torso of secular music. All the same, Ryba’s musical legacy is truly remarkable. He composed dozens of arias, pastorales and other smaller pieces intended for the church, as well as 89 masses, but also some extensive and for his time remarkably progressive compositions. language in sacred music. Alongside with his absolutely unique Tì Boha vychvalujem (Te Deum), Chválozpìv k sv. Janu Nepomuckému (The Hymn to St. John Nepomuk) from 1803 and two Stabat Mater compositions, his affection for his mother tongue is most clearly attested by his Nešporní zpìvy (Chants for Vespers) from 1798, for which Ryba translated from Latin and put into verse five Sunday psalms and the Magnificat. Prague, only a few pieces have survived: several unusually technically difficult violin concertos, a concerto for violoncello, two symphonies and four quartets. At the intersection of sacred and secular music lies the only surviving set of organ works from 1798 titled Novae et liberae cogitationes, in which Ryba gave vent to his “new and free ideas.” He provided the introductory Toccata with comments in Latin, enhancing his composition with an extra-musical philosophical program. Ryba’s relationship to the town of Plzeò was permeated with thankfulness to the place where he never lived, but where his compositions found recognition already during his lifetime. He lived to see not only respect and admiration (crowned in 1805 by the town granting him honorary citizenship) but also financial support for his son Vilém when he studied there. Ryba was determined to do his best to return these favors. The Stabat Mater must have spoken to Ryba very urgently, which is probably why (unlike most composers of his time) he set this hymn to music no less than three times. Twice he used a Czech translation, while his third Stabat Mater from 1805, an extensive and exacting piece for soprano, alto, tenor, bass, mixed choir and orchestra, employed the Latin original. He divided the text into twelve musical movements, wherein each of the soloists was entrusted one aria, and the tenor and bass one more accompanied recitative each. There are also two solo quartets, two choral numbers, a duet for soprano and alto, a trio for soprano, alto and tenor, all this preceded by a weighty and dramatic instrumental overture. starting with the legacy of the late Baroque, through high Classicism to the beginning of Romanticism. crucifixion: the chaos in which the Earth’s foundations were shaken, the cruelty and extreme emotional strain, weeping, compassion and moaning. The dynamic rhythmic pulsation in the strings in triplets is interspersed with semitone sobs in the bassoons and furious interjections of the flute and the clarinet. The music builds rapidly, soon leading to the first climax. Now the turmoil of the sixteenth-note motion in the violins is unleashed. However, in the deep strings there is still the triplet rhythm and the kinetic tension ensuing from this conflict strengthens the dramatic character of the movement even more. Another striking element of the introduction is a syncopated rhythm, which in its kinetic instability supports even more the overall tense character of the movement. The structure of the whole introduction is just as pulsating as the opening few bars, in which (as in Beethoven) the “DNA” is encoded from which then everything stems. After several climaxes the movement returns to pianissimo and at the very conclusion Ryba presents a pensive semitone motif in the oboe, derived by diminution from the introductory melodic line of the bassoons. The whole movement concludes with a gradual soothing of the rhythmic motion and lowering to pianissimo. The composer passes into the vocal portion with a surprising, terse E flat major chord of the whole orchestra in fortissimo, which comes quite unexpectedly, immediately after the general pause. 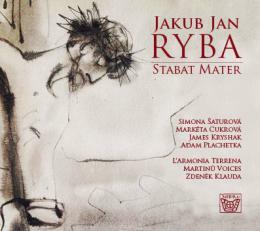 Ryba entrusted the first verses of the Stabat Mater sequence to the quartet of soloists. This part already radiates the Romantic spirit of the composition with beautiful melodic inventiveness, which touches the listeners and conveys to them the suffering of the Mater Dolorosa standing right under the cross, on which her son Jesus is dying. Several times 1819 during the movement we hear a sequence of two terse chords of the whole orchestra, which suggest a sword penetrating the mother’s heart (“pertransivit gladius”). The grid of voices is also penetrated by the extended semitone motif, known already to the listeners from the introduction, which works here, among other things, as a unifying factor. important roles for flute, oboe and bassoon. The bassoon imitates and develops the thematic material of the aria, whereas the flute and the oboe introduce new musical ideas that are combined in counterpoint with the main melodic line of the solo tenor. The string instruments are mostly entrusted with merely a simple “oompah” accompaniment; only the violas, cellos and double bass join the dominant flute line in contrary motion. The aria concludes with a pensive thematic cello reminiscence. The soprano aria “Eia mater” is the very heart of the composition. This extensive and masterfully throughcomposed aria with several concertante instruments (oboe, clarinet, bassoon, viola and cello) is a real gem in the genre of sacred aria. Its clarity and brilliance refer to the musical language of the high Classical style. When we listen to the virtuoso clarinet part we must think of the aria of Sesto (“Parto, ma tu ben mio”) from Mozart’s opera La clemenza di Tito. Did Ryba know this opera? The “minor-mode Ryba” never ceases to amaze us with his versatility and compositional mastery. Just when we are starting to feel that nothing can surprise us, he brings in a pensive violoncello solo, to which the solo voice momentarily subsides and which “sotto voce” (in muffled voice) presents its sensitive counterpoint. The following bass aria “Fac, ut ardeat” presents flute as the concertante instrument and also brings to the fore the solo heckel-clarina. To this instrument he only entrusted the typical rhythm and melody of a fanfare, but in combination with a soft flute part and the brilliantly composed bass solo it forms a well-balanced whole. The solo part is replete with heroic male singing, giving vent to the joy redeemed by pain, but also with delicate (dolce) and virtuoso coloratura passages. whole piece which at the same time uses the most modest instrumentation. It is composed for soprano, alto and tenor; all that is left of the orchestra are the violins, cellos and basses, supported by a pair of French horns adding color. The solo voices are supplemented by instrumental solos of violins and viola. These two instruments are entrusted with the opening section and their harmonious interplay forms the overall positive character of the movement. The main theme is then taken over by the alto. The soprano and the tenor introduce new themes, which are further developed and undergo a series of transformations. This section is especially inventive, consisting of three recurring thematic segments. The concluding coda is formed from the material of the main theme. The brief tenor recitative and arioso “Fac me vere” is written in the unusual key of D flat major; the vocal line is supported only by string instruments and continuo (harpsichord or organ). After several bars the recitative flows into an arioso, where as a reminiscence the introductory theme from the first part of the Stabat Mater reappears. playing pizzicato, with occasional passages played by pairs of bassoons and French horns in the background. Thus the entire musical and extra-musical message is concentrated in the vocal part. Its genuine humility and modest but effective means of expression are very typical of Ryba’s style. The accompanied recitative (accompagnato) “Fac me plagis” is composed for bass and strings with continuo. clarinet and the French horn come to the fore. The whole movement is permeated with a soothing figuration of semiquavers in the clarinets, helping to create an airy harmonic foundation, over which other thematic lines float elegantly. the diabolus in musica, i.e. devil in music); later other voices join the soprano and resolve the dissonance back to the tonic. Here in a bright C major the whole composition ends and the path “per aspera [C minor] ad astra [C major]” is completed. The spiritual message of the meaning of Christ’s death reverberates in every bar of this work, indeed in every single note.